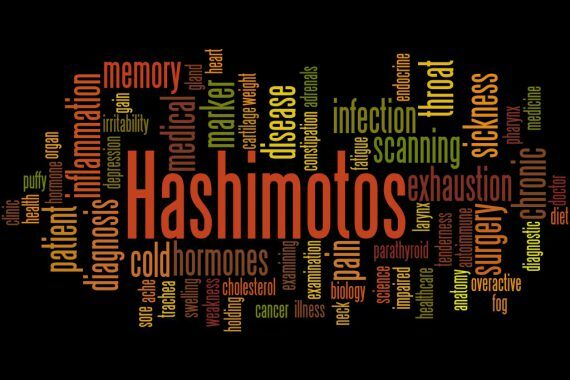 If you suffer from symptoms of low thyroid, it’s likely that Hashimoto’s is to blame. You may not have heard the name before, but it’s estimated that Hashimoto’s thyroiditis is the root cause behind 90 percent of thyroid problems in the U.S.
What’s crazy is that even if you have Hashimoto’s, you might not know it because thyroid problems are notoriously underdiagnosed by doctors today — leaving you to think it’s all in your head. Fortunately, there are things you can do to feel better. First, ask your doctor for bloodwork. Remember to be specific. You should also begin supplements to support and nourish your thyroid. Iodine is a necessary element for your body to make the thyroid hormones to keep you running. And since your body can’t produce iodine, you have to either get it from your daily diet or take a supplement. The most potent, natural source of iodine is found in sea vegetables, especially kelp. The iodine in kelp gives your thyroid the fuel it needs to create those critical T3 and T4 hormones. Plus, the seaweed provides powerful antioxidant and anti-inflammatory properties to reduce the oxidative stress assaulting your thyroid gland. Like iodine, l-tyrosine is a building block for your thyroid hormones. In fact, your body combines the two compounds in order to create the T3 and T4 hormones you need to burn the calories you eat each day and stay trim. Scientific studies have proven that reductions in tyrosine lead to thyroid hormone disturbances. Foods that are rich in tyrosine include seaweed, eggs, cottage cheese, salmon and turkey. Selenium is a naturally occurring trace mineral that helps convert the relatively inactive T4 hormone to the active thyroid hormone T3 — the one your body uses to keep you fueled up and your metabolism strong. In addition, it’s a potent antioxidant that can protect your thyroid from the damage caused by free radicals. In fact, in healthy adults the thyroid is the organ with the highest amount of selenium per gram of tissue and it needs the mineral to function optimally. Selenium rich foods are Brazil nuts, eggs, sunflower seeds, chicken and brown rice. Zinc and your thyroid is like the chicken and the egg… which comes first? Zinc deficiency leads to hypothyroidism and hypothyroidism leads to zinc deficiency. The only way to correct both is to get more zinc in your diet to help convert the T4 hormone to the more active T3 and release the vitamin A stored in your liver to help support a healthy thyroid. Foods to eat include meats, shellfish, eggs, beans, nuts and seeds. Copper is another trace mineral your body needs for healthy thyroid function. It helps stimulate your thyroid gland and even protects your body from too much thyroxine building up in your blood — known as thyrotoxicosis, a condition that can cause goiters. Foods that provide the copper you need are liver, oyster, shitake mushrooms, lobster, nuts and seeds. Ashwagandha root is especially important for people with Hashimoto’s because it helps regulate the autoimmune inflammation that damages your thyroid and results in hypothyroidism. And it also works as a potent antioxidant, to protect your thyroid, improve its function and boost its production of T4. Since there are no foods that contain Ashwagandha, you’ll need to get it in supplement form. Remember, you have a 90 percent chance that your thyroid problems are caused by Hashimoto’s — an autoimmune response. If you haven’t yet been diagnosed, ask your doctor for the right bloodwork to confirm diagnosis, rest assured that your symptoms are not all in your head and get plenty of the six nutrients above to support and optimize your thyroid function either through diet or supplementation.